Welcome back to our continuing series of blog posts designed to inform you about all the new holiday decorating products Team Santa Inc.is offering for sale for the 2018 holiday decorating season. When you are decorating for the holidays, a wreath is always the staple piece of every holiday display. Rarely do you see an outdoor lighted holiday display that includes a bunch of lighted decorations but no wreath. It just doesn’t happen too often because the Christmas wreath is the universal symbol of the Christmas holiday. 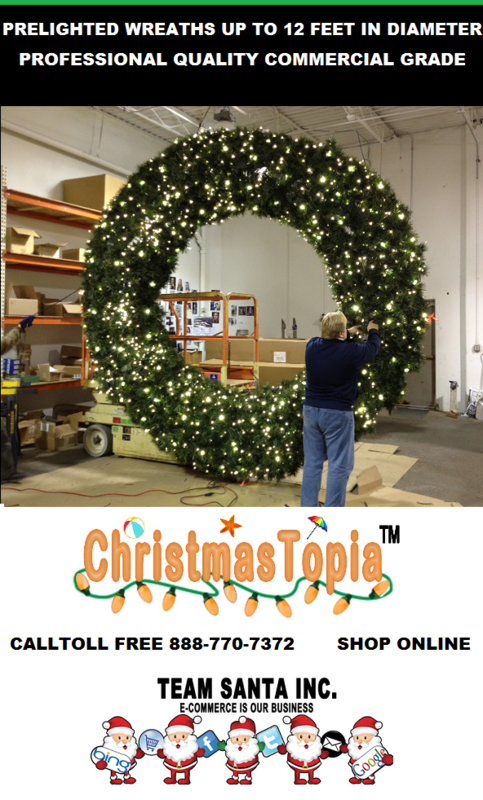 At Christmastopia.com, the selection of wreaths both lit and unlit is comprehensive to say the least. We split up the wreaths by “lighted” and ‎“not lighted” so it’s easier for you to review the big product line. Team Santa Inc. sells professional quality wreaths illuminated or not, up to 12 feet in diameter. Lighted commercial quality wreaths that are professionally built and are absolutely gorgeous. Should you want a big lighted wreath for the holidays, that makes a real impression or non lighted wreath that makes a real impression, call us because we have both. Call us toll free anytime at 866-770-7372 or send email to support@teamsanta.com. We are happy to help you. So if you know anyone looking for a giant Christmas wreath, please tell them to go to Christmastopia.com or give them our phone # 888-770-7372. Whether you call us or you shop online you will absolutely enjoy our magnificent selection of giant sized holiday wreaths..
I’ll be back tomorrow to show you another new exciting product. The 2018 holiday decorating season is right around the corner so we have to get ready. 😎 We have tons more stuff to show you before the holiday decorating season begins.